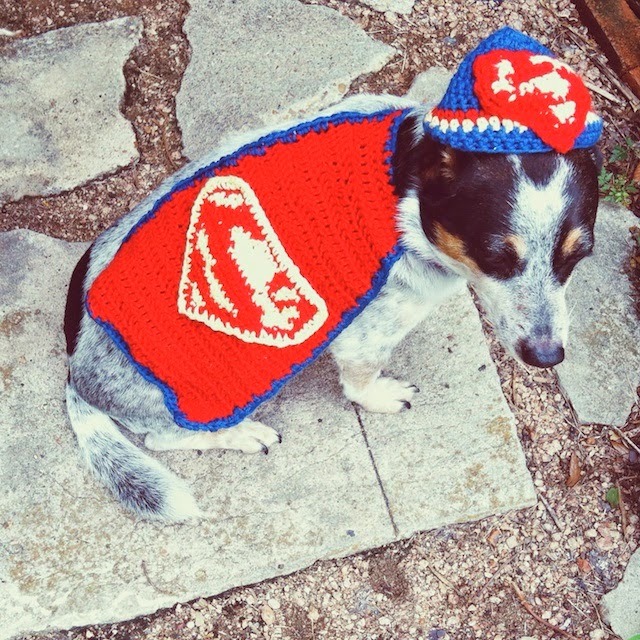 It's a bird...it's a plane...it's a dog in a crocheted baby cape! It may be tacky, but I had to do it before I sent the cape away. Don't worry I lint rolled it before packing. It wasn't the baby pattern I would have picked. I wanted to make him a Gramps, because it's adorable, knitted, and only requires a pipe to finish the look. 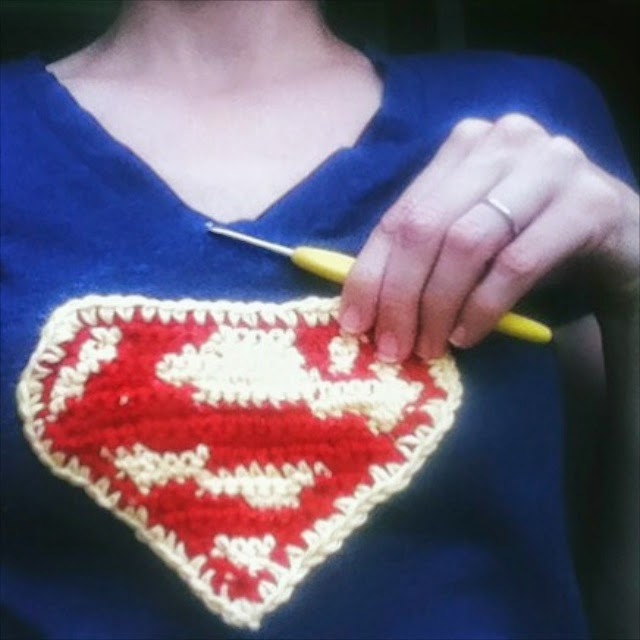 But this one is what Mom asked for, so I thought I'd give crochet a try. 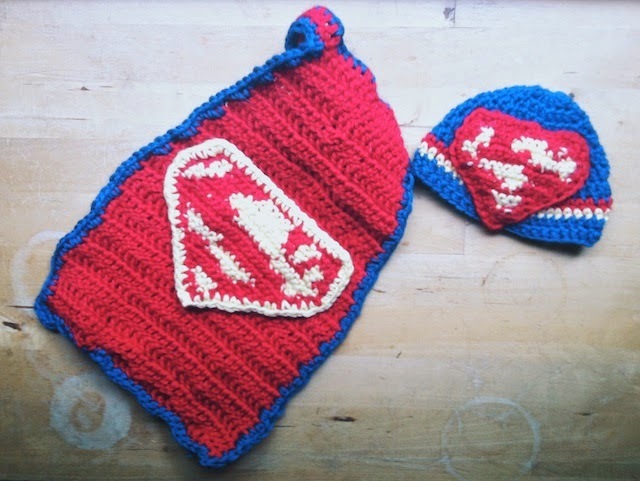 I used the Newborn Superman Costume by Family Bugs. In the end, I'm glad she wanted crochet because Guys! I learned to crochet and made a baby garment in five days. Is that not crazy? I guess crochet is to knitting like Italian is to Spanish, knowing one is a back door into the other. I used a hodgepodge of yarns (Berroco Comfort in blue, some hobby store cotton for the yellow, and Lion Wool in red) because the red I ordered was too much of a burgundy. By the end of the first day I had the hat done. Of course it was large enough to fit Dad's head, but at least I understood the concepts involved. As with knitting, I had to go down 3 or 4 hook sizes and try again. 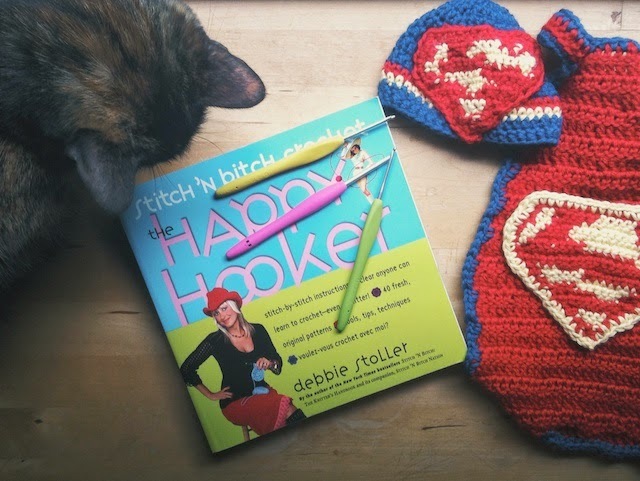 I used hook sizes b,c, and f.
Even with a stitch book, I found myself just improvising to crochet this gift quickly. It was freeing to know so little that I didn't know if I was doing it wrong. I figured out a way to hide color changes better behind the emblems. It may be the proper way. It may be the sloppy way. I don't know, and it didn't matter. That was nice. And so, after a week, the baby gift is finished. Be aware that if you ever request a knitted or crocheted gift from me, it may have been pre-worn by an animal. Sorry, that's part of the deal. I see this as the first step into the big world of crochet. Next up will be Betty... Betty Grable by Rohn Strong, which I won yarn and pattern for in the Holla Knits KAL. Okay, I realize it would be kind of a huge step, but I will have Debbie Stoller right beside me. Now, it's back to spring/summer knitalongs. I loved the cape on your little dog! I was thinking our my mother's dog, she (India) wouldn't be happy at all with it. I made her once a blanket for the cold and she refused to walk. 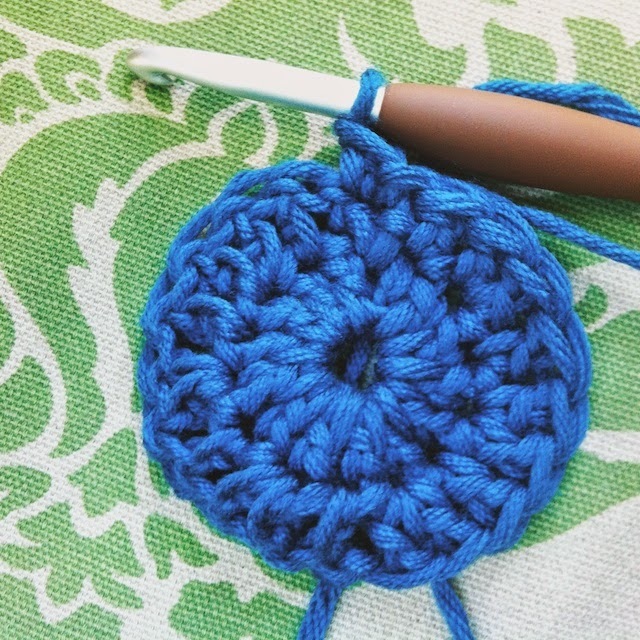 I started crochet way before knitting and I find it easier, especially to improvise. I also find it more suitable to make things for the home and I'm more into making garments right now. I barely crochet nowadays. The last thing I made was Gerry's nest. But I love the cape and the S emblem is so cool that I might try it one day.